A semi detached house is one where you share one, party wall with another house. While it might sound terrible, there are lots of benefits of living in a semi detached house. For starters, you get to share several costs with your neighbor, making them more economically worthwhile. For example, you can negotiate a better deal for your roof. But to the point, this house has it all. Spacious living room with light coming from two sides thanks to the glassed walls, large yard, big kitchen, and everything else you could ask for in a house where you welcome your friends, family and colleagues. For your quiet, private and intimate nights, you have the bedrooms on the second floor of the house. Toilets and bathrooms are also placed on the second floor. With a spacious living room as this one, you get several spots where you can chat with your friends. You want a more of a cozy feeling? Sit and relax on the leather furniture. You want more of a bar, close up chat and gossip? Use the club table. 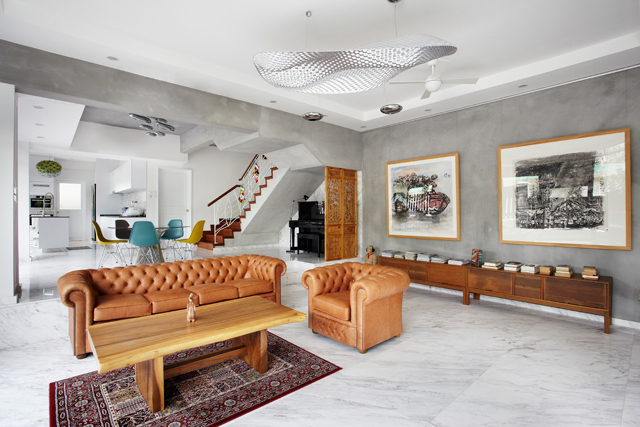 The combination of several materials in the living room, including marble, wood, plastic and glass, give this house a unique style and feeling.